Good day sketching at Elliot Bay Books. Good to see familiar faces from Volunteer Park. 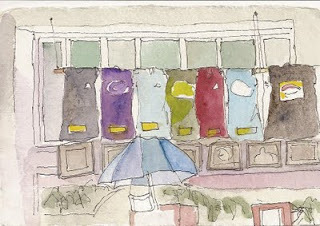 T-shirts in front window - I loved the colors and whimsy of a clothesline in the bookstore. Beautiful! What a great start to the collective sketchbook from our day at the bookstore!